At the Lexus Cup of China, the International Skating Union's Grand Prix of Figure Skating, there was a real humdinger of a bell-ringer between China's Han Yan and Japan's Yuzuru Hanyu in warmups. YouTube shows both men gliding backwards at concussion-ready speeds and turning into one another, chin-to-noggin, too late for either to adjust. Human pain is fun to watch, within reason, and because we're all hoping you send this post to your friends, we're going to include it here. Hashtag morbid curiosity, hashtag guilty pleasure, hashtag YOLO. The collision opened up Hanyu's chin and left him motionless for a moment. Medical folks checked him out and then cleared him for his free skate. At the 24-second mark of this video you'll note the hurried removal of the not one but two stuffed Pooh bears behind our man Yuzuru. Clearly things were supposed to turn out a bit differently. 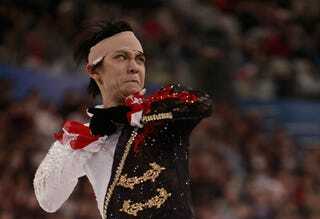 Sporting a big ol' head bandage, poor guy then went on a falling binge during his free skate routine. Whether Hanyu was addled or just rattled, it's hard to tell. Again, we offer you the video. Go ahead. Watch an injured 20-year-old suffer the implosion of his dearest dreams as he physically humiliates himself in front of thousands. It's not as if anyone will ever know what kind of warped joy you're deriving from it. Click away, modern gentleman. Actually Hanyu, the reigning Olympic champion and thus a badass of the highest order, managed to weather this debacle and finish second at the Cup. See? Happy ending. This has been figure skating news brought to you by our shared appreciation for violence and pratfalls.